Caterpillar, the $39 billion maker of machines that dig mines and lay asphalt, is ready for a metamorphosis. Daft deals hatched at the height of the commodities and Chinese investment booms have trashed the company’s stock and damaged the credibility of its management. An investor seeking change, potentially a breakup of the conglomerate, could play well on Wall Street, if not in Peoria. The company led by Chief Executive Doug Oberhelman emits the kind of pheromones that attract pushy investors like Nelson Peltz, whose Trian recently bought a stake in General Electric. Caterpillar has no single large shareholder, making it easy for an activist to creep into the capital structure and make a stink. Caterpillar’s executive team is also vulnerable. Five years ago, the company, based in Peoria, Illinois, struck its biggest acquisition since founder Benjamin Holt rolled out the first of his steam tractors capable of crawling, caterpillar-like, over soggy farmland. Just after taking charge of the company that has now employed him for 40 years, Oberhelman paid $8.6 billion for Bucyrus, which makes equipment used to mine raw materials like iron ore. The deal is fast becoming a case study in bad timing. A global commodities glut slammed Caterpillar’s new customer base, and shows no sign of relenting. Anglo American, for instance, this week initiated a restructuring that will cull 85,000 employees. Shares of the seven big London-listed miners have halved in value this year. Caterpillar’s own stock has shed a fifth of its value since acquiring Bucyrus. The S&P 500 Index, by comparison, has gained 72 percent over the same span. And Bucyrus’ main rival, Joy Global, has lost 84 percent of its market value, implying that Caterpillar has been dragged down by infesting its other world-class businesses with dangerous commodities. Though Caterpillar is best known for its earth-moving machinery, Credit Suisse notes that the company derives 39 percent of sales and 53 percent of profit from its energy and transportation business. That division manufactures turbines and other apparatus that compete with GE, whose shares have nearly doubled since Caterpillar bought Bucyrus. Add it all up and Caterpillar may soon find itself exposed to a new investor eager to crack open the chrysalis in search of a butterfly. Caterpillar’s board on Dec. 9 voted to maintain its quarterly cash dividend of $0.77 per share of common stock, payable on Feb. 20, 2016, to stockholders of record at the close of business on Jan. 20, 2016. “Paying a dividend in times of business and economic uncertainty and throughout business cycles is a priority for use of our cash,” said Caterpillar Chairman and CEO Doug Oberhelman. 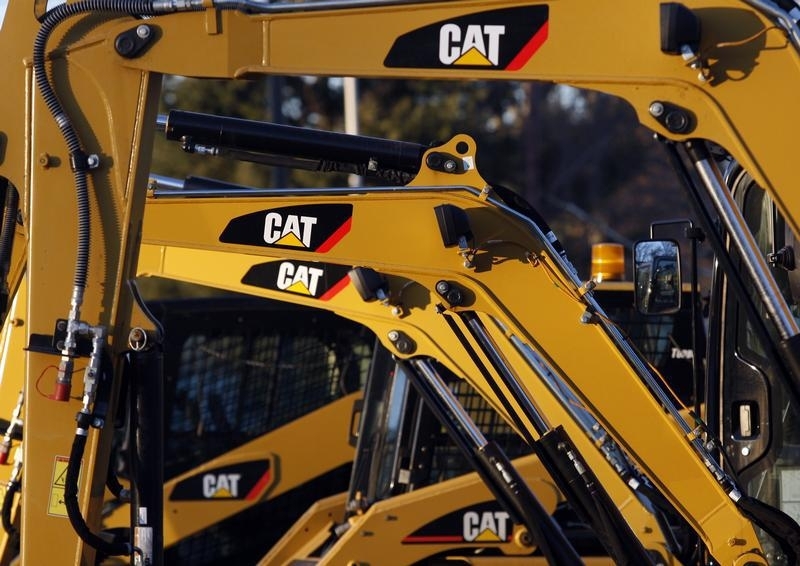 Caterpillar has paid higher dividends to its stockholders for 22 consecutive years, and since 2007, the company’s cash dividend has more than doubled. Caterpillar has paid a cash dividend every year since the company was formed and has paid a quarterly dividend since 1933.